This morning Israel called in armoured bulldozers to destroy the access road to the Bedouin community. The road is already repaired and people are as determined as before to resist Israel’s ethnic cleansing. This morning over 200 Israeli soldiers arrived with their weaponry and bulldozers to destroy the new neighbourhood of Khan al Ahmar, called Wadi al Ahmar. Khan al Ahmar’s resistance rises! 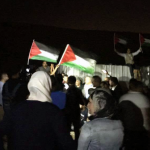 After Israeli courts have decided on the imminent destruction of Khan al Ahmar, the Palestinian Bedouin community located East of Jerusalem, popular resistance is building to defend the community. 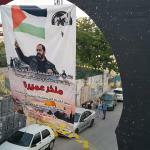 Israel decides on destruction - Defend Khan al-Ahmar now! After years of resistance and a month of legal battles, as expected the Israeli courts voted in favour of ethnic cleansing of the Palestinian Bedouin community. In exactly one week, Khan al Ahmar is up for destruction. Click below and help us stop the demolition. 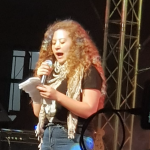 On August 11, Nabi Saleh hosted some 700 people that gathered for a one day event, dominated by the power of a new generation of women in struggle. 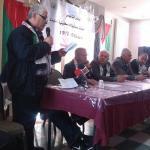 The festival honoured Palestinian prisoners and reinforcing resolve no Israeli repression will stop popular resistance. 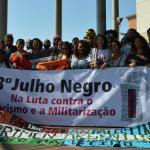 On Friday, July 27, in Rio de Janeiro, a full day of initiatives against militarism in Latin America is being organized under the title “United Struggles Against Militarization, from Latin America to Palestine”. 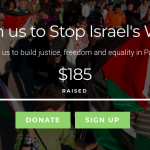 Until July 17: build pressure to Save Khan al Ahmar! On Monday, the Israeli High Court issued a decision to delay the demolition of Khan Al-Ahmar, the Palestinian Bedouin Community East of Jerusalem until July 17. 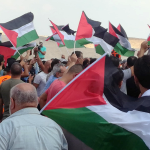 Palestinian lawyers representing the residents of Khan al-Ahmar village in the West Bank filed a petition last week, claiming that no eviction orders had been given to the residents. Khan al Ahmar - expulsion stopped until July 11! 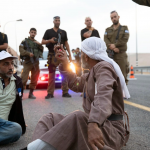 The community of Khan al Ahmar and the popular resistance in Palestine has won a small but significant battle against Israeli ethnic cleansing. 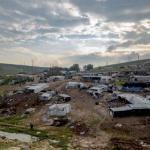 The occupation forces have to stop their onslaught until July 11. Your action is crucial now! Act Now - It’s not too late: Save Khan el Ahmar! Since yesterday, Israeli bulldozers and some 300 Israeli military and intelligence officers have started the full scale onslaught to destroy the Bedouin community of Khan el Ahmar. 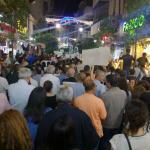 People are still resisting and need your support! 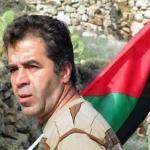 Below, we republish an interview with Jamal Juma' on Mondoweiss. On June 4, Ida Audeh spoke to Jamal Juma’, coordinator of the Palestinian Grassroots Anti-Apartheid Wall Campaign, about the popular resistance in Gaza, the Trump administration’s policy toward the question of Palestine, and Palestinian options to chart a new course. On Thursday 28 June 2018, Israeli Occupation Forces arrested the popular Palestinian activist Wael Al-Faqeeh from his home. His violent arrest and illegal detention in Megiddo prison inside the Green Line is part and parcel of Israel's attempt to crush Palestinian popular struggle and silence the voices of protest as it intents to finalise the Bantustanization of Palestine. 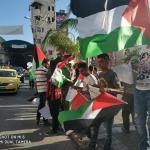 On Wednesday, June 27, youth movements and other popular forces have joined in a protest in Tulkarem to reiterate the call of the Palestinian people on the Palestinian Authority to lift the sanctions from Gaza. See the video here. 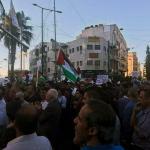 Protests grow stronger and more determined: PA, lift the siege from Gaza! 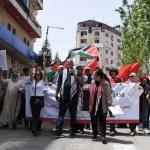 On Saturday afternoon, for the third time in the last weeks, masses poured on the streets of Ramallah to demand from the Palestinian Authority (PA) to immediately end their own sanctions on Gaza that compound the horrific Israeli siege. The police brutality last week has not weakened the resolve of the people - more people came out on the street with more resolve and PA forces trying to make amends. Since June 8, in Palestine popular anger about the Palestinian Authority’s policies against the people in Gaza has transformed into vocal protests. People of all walks of life joined the protests driven by Palestinian youth. 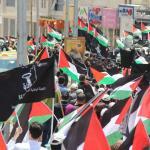 As on June 13 a second protest was held, the Palestinian Authority tried to drown the protests in brutal repression. Yet, a people fighting since 70 years for justice against Israeli apartheid will not be deterred to stand in solidarity with their people in Gaza. This Saturday new protests are being organized. It has been far too long that Ramallah hadn’t seen a protest of such dimension and intensity. 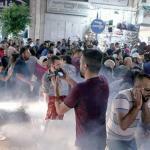 After the daily breaking of the fast during Ramadan, over 2000 people filled the streets of the city. It wasn’t a joyful family gathering but an angry protest in solidarity with Gaza. Asserting their commitment to the unity of the Palestinian people, people protested against the Israeli siege on Gaza and the policies of the Palestinian Authority (PA) that pose additional pressure on the people in Gaza and lack any popular support or legitimacy. Munther Amira released from prison! A committed activist that tirelessly mobilizes popular peaceful resistance and steadfastness, had been arrested on December 27 during a protest against the imprisonment of Ahed Tamimi. After six months in jail, on Wednesday, June 6, Munther has been released. 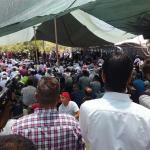 Around 2000 Palestinians gathered on Friday, May 25, in Tantoura, an ethnically cleansed Palestinian fisher village close to Haifa, to commemorate the massacre of Tantoura and the ongoing Nakba. Palestinians from both sides of the Green Line broke the walls of fragmentation to come together in struggle and unity. The last weeks have demonstrated not only Israeli inhuman brutality as it perpetuates its regime of occupation and apartheid. They have shown that Palestinian collective, non-violent resistance is becoming the weak spot for Israeli occupation. Be part of this movement and send today a message that the world cares. 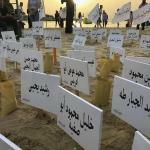 Palestinians all across their historic homeland observed a day of general strike in mourning of the 62 killed and over 2700 maimed and injured on May 14 in Gaza and of 70 years of ongoing Nakba, the ongoing ethnic cleansing, dispossession and repression of the Palestinian people by Israel’s apartheid regime. At the same time dozens of protests were held in all major Palestinian cities. 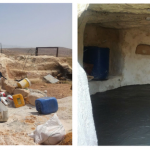 The Palestinian community of Tana has resorted since 2017 to live in the caves in the area after their homes have been demolished over a dozen times by Israeli military. Now, Stop the Wall and partners have joined the community to transform the caves into spaces of resistance and dignified existence to allow the families a modest life of steadfastness. On May 2, as part of its International Workers’ Day actions, the New Unions joined a popular march organized by the Minimum Wage Campaign. The first of May encompasses the best of human values: freedom, justice, equality, and peace. Human history coalesces through the blood and oppression of the workers and downtrodden who sacrificed – and still do – on the social, political, and economic stage. The liberation of human potential and labor from any form of exploitation and robbery has been one of the most prominent struggles which, throughout history, has embodied the highest universal values. Many have been martyred for the sake of these values, and the first of May is symbol of this struggle and an honor to those it has claimed. Emergency Action: Not One Tree Less! 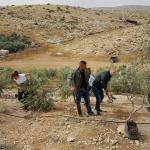 In reaction to the uprooting of 320 olive trees by the Israeli military in Bardala, the Stop the Wall Campaign and partners have organised only 48 hours later an ad-hoc tree planting voluntary day to re-plant trees on the very place Israel has wrecked havoc.